NHL News : Two young NHLers land on waivers Sunday. Two young NHLers land on waivers Sunday. The Montreal Canadiens continue to shift players off of their main roster. According to a breaking news report from TSN National Hockey League insider Pierre LeBruin we now have two additional players on waivers today, the first being another player from the Habs organization with the Chicago Blackhawks also placing a player of their own on the waiver wire. The most significant of the players being waived today has to be former Pittsburgh Penguins draft pick Kenny Agostino. Agostino, a former Penguins 5th round selection (140th overall) at the 2010 National Hockey League Entry Draft, has bounced around quite a bit during his NHL career thus far since being drafted. 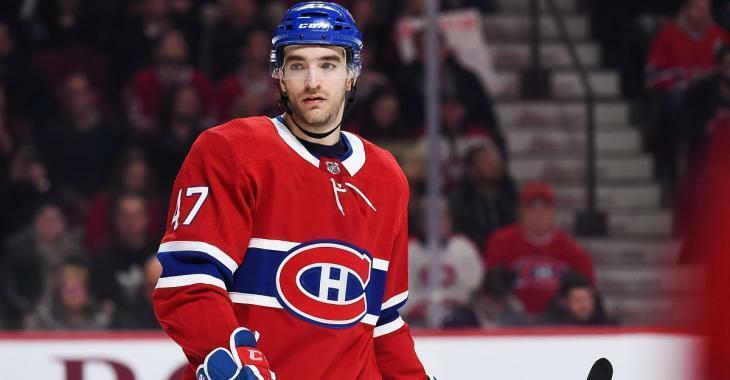 Prior to joining the Canadiens organization the 26 year old winger has played for the Calgary Flames, the St. Louis Blues and the Boston Bruins but it was the Canadiens who gave him his biggest shot at the NHL level. Agostino has appeared in 36 of his 58 career NHL games with the Habs this season and has fared well for himself picking up 2 goals and adding 9 assists for a total of 11 points on the season. He has also however landed himself in the penalty box at times with 26 penalty minutes to his name this season and currently boasts a plus minus rating of -1. Given the sheer number of teams familiar with him as well as his value as a depth forward it's not outside of the realm of possibility to think he may not clear waivers. The other man being sent to waivers today is Chicago Blackhawks defenseman Luc Snuggerud. Snuggerud is a former Chicago Blackhawks 5th round selection (141st overall) at the 2014 NHL Entry Draft that has never appeared in a single NHL game throughout his career. In fact his play this season has been limited to just 4 games overall, all of which have come in the American Hockey League with the Rockford Icehogs. Through those 4 games he has no goals and 1 assist and is a plus minus of -4 on the season thus far. No disrespect to Snuggerud but I do not see many teams have interest in acquiring him, even through waivers. Update: Snuggerud has been placed on waivers for the purpose of contract temrination.